The koto (written as 箏 in Japanese) is a handmade stringed instrument. The body is made from Paulownia wood, the strings made from plastic (they used to be made of silk! ), and bridges made from plastic/ivory. 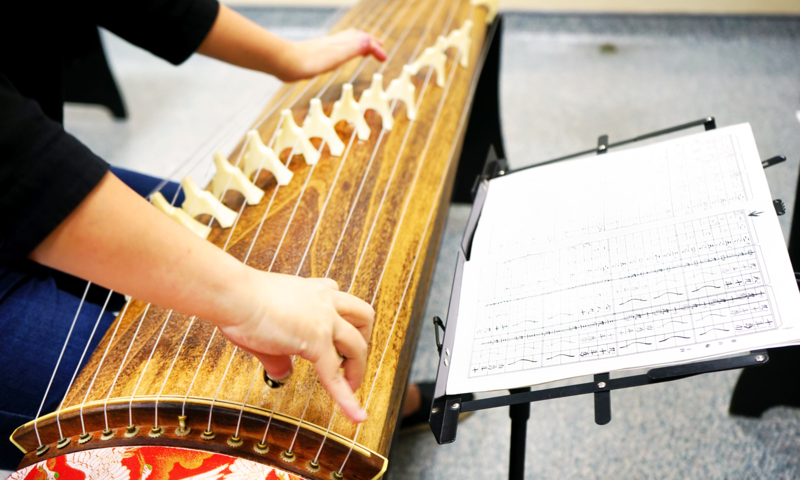 The standard koto is about 1.8 metres long, and has a total of 13 strings. There are other varieties of the koto, like the 21 string or even the 88 string koto. However, the most popular are the 13 string koto, as well as the 17 string koto, or the Juushigen (bass koto). The bridges are movable pieces used to change the tuning of the strings. So you can tune to virtually any note on the koto, because the bridge positions can be adjusted easily to play a particular note. Bridges are fairly standard in shape, but they also come in various sizes to allow for greater variety of notes. The right thumb, index finger and middle finger wear a plectrum called ‘tsume 爪’ (pronounced as tsu-meh), which is traditionally made of ivory (but the cheaper ones are plastic). These tsume can be seen in the picture above. The three fingers wearing the tsume help to push, pluck or stroke the strings, while the left hand helps to either pluck, vibrate, or press the strings. 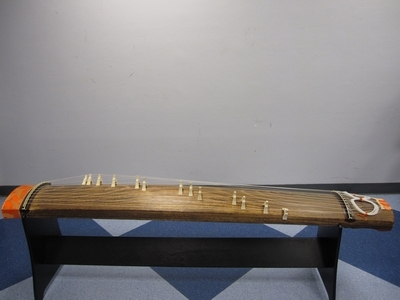 There are several different techniques involved to produce various pitches and sound effects on the koto. There are other characters on the score (e.g. ス, ×, etc. ), which are indications of techniques to be used. Sometimes there are lines indicate the note value (how long to play each note), and there are scores which use grids. Notes that are side by side are to be played simultaneously, while notes with an indication of (左) are to be played with the left hand. Circled numbers are to be plucked. As with all musical instruments, it’s hard to understand all of this without actually trying the instrument itself. Do pop by our practices if you are interested in learning.